Dr DY Patil Vidyapeeth Pune BBA Admission 2019 - Dr. D.Y. Patil Vidyapeeth (DPU), (Global Business School & Research Centre), Pune invites applications for admission to Bachelor of Business Administration (BBA) Program through DPU Entrance Test for the academic session 2019-20. 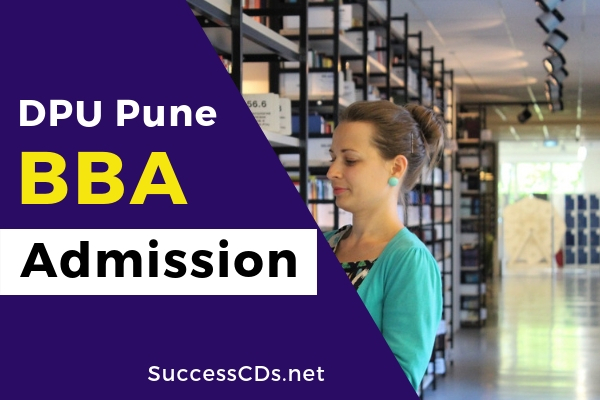 Complete details as provided below such as Dr DY Patil Vidyapeeth Pune BBA Admission 2019, eligibility criteria, selection, application form and fees etc. Global Business School and Research Centre and congratulate you to choose Bachelor of Business Administration (BBA) Program. This is a full-time career oriented Graduate Program in Management. The duration is three years. On successful completion of the course the students are awarded the BBA degree. The BBA curriculum is designed to provide industry with young managers at entry level positions for their first experience in a corporate role. Re-accredited by National Assessment and Accreditation Council (NAAC) with a CGPA of 3.62 on a four-point scale at "A" Grade. The duration is three years. On successful completion of the course the students are awarded the BBA degree. A candidate for being eligible for admission to the Degree course in Bachelor of Business Administration shall have passed 12th Std. Examination (H.S.C. 10+2) from any stream as passing subject and has secured 45% marks at 12th Std. Visit https://admissions.dpu.edu.in to apply online. Fill up the information in own handwriting. Paste photographs (taken from the same negative). Do not staple the Photographs. Forward the Application Form (duly filled in) along with a Demand Draft of Rs.1500/- drawn on any nationalized Bank, in favour of "The Registrar, Dr. D. Y. Patil Vidyapeeth" payable at Pune. Demand Draft of Rs.1000/- if Appeared for MAT/CAT conducted by the AIMA, New Delhi and wants to appear for GD/PI of our University drawn on any nationalized Bank, in favour of "The Registrar, Dr. D. Y. Patil Vidyapeeth" payable at Pune. Send the Application forms mentioning over the envelop "APPLICATION FORM FOR AICET-2019 (BBA)" addressed to "The Registrar, Dr. D. Y. Patil Vidyapeeth, Pune Sant Tukaram Nagar, Pimpri, Pune-411018 (Maharashtra)"
Results will be displayed on the Vidyapeeth website at www.dpu.edu.in. Results of individual candidate will not be communicated on telephone or by post.